Stefanie Pillora reflects on her time working with Marg Barry and wonders how she would respond in this age of sophisticated community consultation methods which seek to avoid the noisy minorities Marg championed. I still miss Marg – a strong, ethical and unorthodox person that I first met in the 1970s. 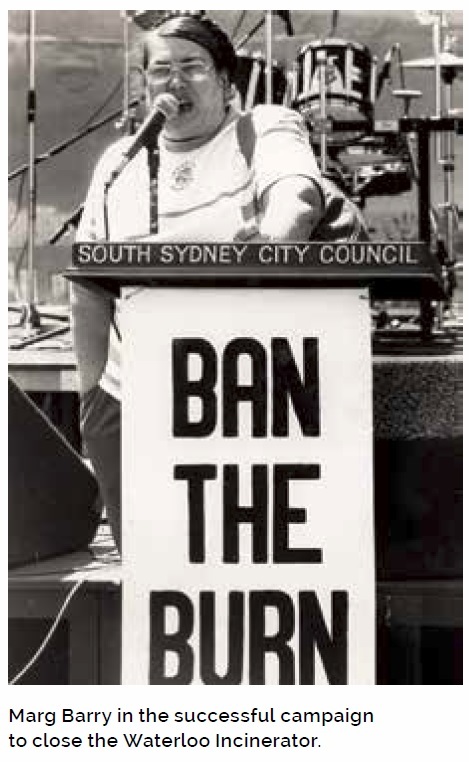 As a community leader, founder of the Inner Sydney Regional Council for Social Development and former City of Sydney councillor, Marg had much to teach young people such as me starting out in community development. I learned a great deal from Marg in my early career working on housing estates and in neighbourhood centres. Whether correcting an article for Inner Voice, advising on how to run a public meeting or providing contacts for a campaign, Marg gave generously of her time. Marg also inspired in me a strong sense of social justice. She cared about the material conditions and the rights of the poor in the inner city neighbourhoods where she lived. And she had no qualms about taking a position on the impact of redevelopment and ‘urban renewal’ on those with the most to lose. The fights led by Marg are legendary. It was Marg Barry who led the fight in 1976 to prevent the then Labor Government from implementing the Housing Commission plan for Waterloo. Jack Ferguson, as Minister for Housing, was committed to a government policy of slum clearance for Waterloo, which already had two tower blocks, and more were scheduled for construction. At that time it was unheard of—and there was certainly no obligation or requirement on government—to have community consultation or negotiation with resident action and local activist groups. That all changed when Marg challenged government and organised Community Resistance…Marg said that no government could be involved in creating the slums of the future. Community consultation has since become an integral part of the development process. In NSW generally, but particularly in the inner city, local residents have been consulted a lot in recent years – whether about the planning system, the future of local government or about specific developments. The methods of consultation have become increasingly sophisticated. The focus is on seeking representative community views so as not to be seen to be negotiating with so called noisy minorities. I am bothered by the term ‘noisy minority’ which is used to shut down dissenting views, whomever expresses them. It includes people regarded as community leaders who are committed to public interest and to representing those members of a community who are least able to represent themselves. People like Marg Barry. If Marg were around I think she would also challenge the assumption behind these method driven consultations, that community life is based around consensus and dialogue. She would not favour this orthodox position of ‘non-oppositional dialogue’ as opposed to an understanding of community, ‘that turns on grassroots oppositional action’ to use Brian Elliott’s model in his 2010 Constructing Community (page 23). While she stayed engaged in public debates, she was not afraid of dissent, of being ‘noisy’, however uncomfortable for decision makers. At a time of increasing cynicism about the integrity of consultation processes and the co-option of ‘community’ for institutional purposes, community leaders like Marg Barry provide a source of inspiration. For more Marg Barry in this issue see – we look back on Marg Barry’s 20th year predictions Forward to the Future.